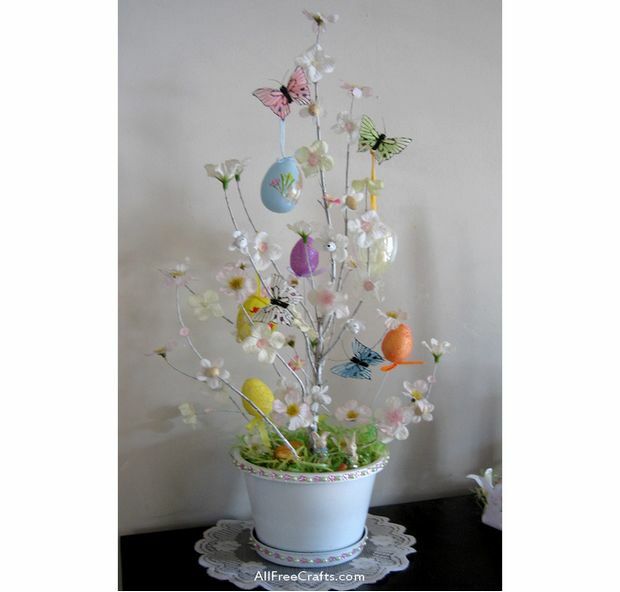 Make a pretty Easter tree for your Easter celebrations from a twiggy potted plant, small white and pink silk flowers, and Easter eggs. For a spring tree, remove the eggs or replace them with brightly colored spring flowers such as daffodils or tulips. Homemade Easter Tree Supplies: start with dry twiggy plants or branches; spray paint, adorn with silk flowers, Easter eggs and small decorations. 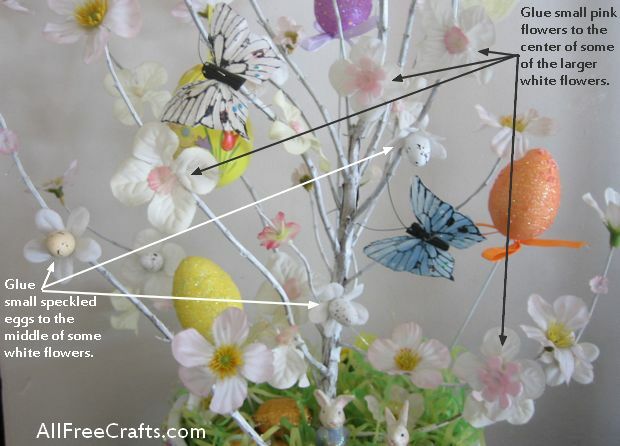 Gluing small pink flowers, or small Easter eggs, to the center of larger Easter tree flowers. 1. 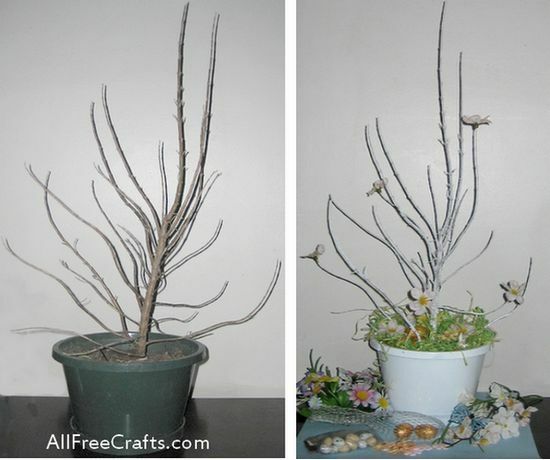 First, prepare the dried twiggy pot plant; I stripped the leaves from a dead rosemary plant. If you don’t have a suitable pot plant, strip any remaining leaves from dried shrub branches that are approximately 18 to 20 inches high. 2. I simply left rosemary in the soil, took the entire potted plant outside, and spray painted the whole thing white. If you’re using branches, you can spray paint only the branches then insert them into a white pot filled with soil, sand, or florist’s foam. 3. Spread Easter grass all around the base of the tree, on top of the pot. 4. Fire up the glue gun and hot glue white silk flowers to the tips of all the major branches. 5. Glue secondary white silk flowers at equal spaces along the branches or on the tips of small branches. 6. Glue tiny pink flowers in the center of some of the larger white flowers, to resemble cherry blossom. Glue tiny speckled Easter eggs into the center of some of the secondary flowers. 7. Insert three glitter eggs picks around the tree, arranging the eggs at different heights among the branches. 8. Fix the butterflies into position around the tree, twisting the wires around appropriate branches. You can suspend each butterfly a little distance away from a branch, then use the wire as a place to hang an Easter egg. This helps a lot if your branches are too close together or too vertical to allow the Easter eggs to hang properly. 9. 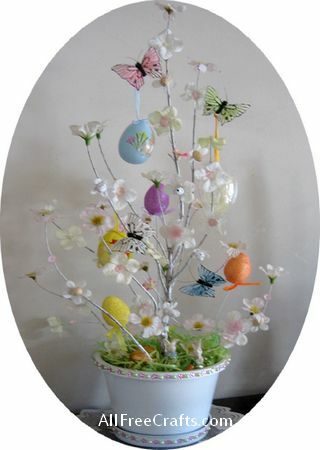 Suspend Easter eggs from their ribbon hangers in larger spaces around the tree. As you can see, I only used three hanging eggs, although it looks as if there are more with glitter egg picks appearing among them. 10. Apply self-adhesive scrapbook border stickers around the pot rim and the pot base; I chose delicate pink pastel flowers interspersed with crystals. 10. Add a few flowers to the Easter grass, nestle in a rabbit or chick, and hide three of four chocolate Easter eggs. Place the pot in a sunny spot where your new homemade Easter tree, and all its decorations, can shine in the light.